Portrait of an Artist (Pool with Two Figures) (1972) has been hyped as the “holy grail” of David Hockney paintings and it goes under the hammer at Christie’s post-war and contemporary evening sale tonight (15 November). Bearing a low estimate of $80m, it may well become the most expensive work by a living artist ever sold by some distance. Yet in the weeks leading up to the sale, many questioned whether the asking price was a bit too bold. With no minimum bid to meet and no money backing it from a third-party, it is an unprecedented move when it comes to a work commanding such a high price. 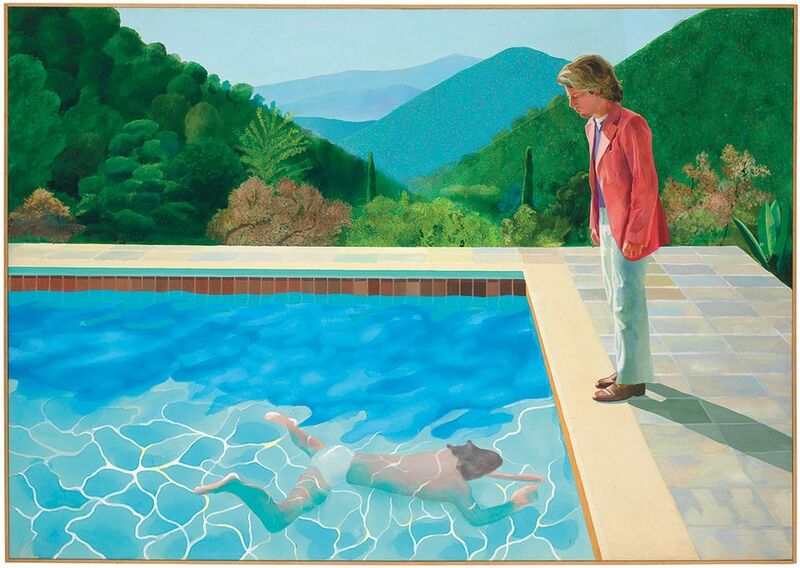 It also means that no matter what, someone is leaving with the Hockney in hand, whether for $10m or $110m. Portrait of an Artist comes to the block from the collection of British billionaire and trader extraordinaire Joe Lewis, who is widely known for selling art as often as he buys it—but only if he is sure the valuation is on point. Last night, Sotheby's contemporary evening sale (14 November) offered a sliver of insight into whether the seller's instincts may well be right as two works by the artist hit their estimates soundly, if not just above the mark. A rare interior scene, Montcalm Interior with 2 Dogs (1989), made its public debut for the first time in 20 years and fetched $12.7m with fees (estimate between $9m-$12m). Moving Wisp (1995), an abstracted landscape, brought in $8.5m with fees on a $5-$7m estimate. To be sure, Hockney has witnessed a surge in demand for his work over the past decade and his auction record doubled within just two years when Pacific Coast Highway and Santa Monica (1990) sold for $28.4m (with fees) at Sotheby’s in New York in May. Should Portrait of an Artist realise anywhere in the ballpark of its estimate, it would propel Hockney well past the auction record for a living artist. Jeff Koons currently holds the title after his Balloon Dog (Orange) (1992-2000) sold for $58.4m at Christie’s New York in 2013. Paul Gray of the Chicago- and New York-based Richard Gray gallery, which has been showing Hockney’s work for 35 years, says collector demand is high for Hockney in general, but the market “favours the archetypal work, [the] pool paintings,” which means Portrait of an Artist’s high price may “cause seller expectations to exceed buyer willingness for a while”, therefore slowing demand. “Inevitably, this sale will cause owners of Hockney’s works to be resistant to sell at all, just as owners of Rothko’s work are extremely resistant,” says Marc Glimcher of Pace gallery, which has represented Hockney since 2008. Once a record-shattering estimate is set, he adds, the perceived preciousness of other works by the artist create conditions that require buyers to offer extraordinary prices to convince someone to part with it. “This sale will certainly accelerate that process for Hockney,” he says. Indeed, the steep price could prove a barrier for institutions with limited acquisition funds compared with private collectors with deep pockets. But Alex Rotter, Christie’s co-chairman of post-war and contemporary department, says the market for Hockney’s work has been a “bit behind in terms of the level at which academics, historians and the public place him”, so the high estimate is not unjustified. Though, without a reserve, it remains to be seen what bidders are willing to pay.